JU’s winning team of students with their advisors at the CFA Institute Research Challenge-Florida. From left, Dr. Daphne Wang, Assistant Professor of Finance; team captain Micheal Muench, MBA student with Finance/Accounting concentration; Christopher Cartwright, Finance/Accounting double major; Hanna McMahon, Finance/Accounting double major; Bryan Shell, Finance/Management double major; and Abdel Missa, Resource Professor of Finance and coach for the JU CFA Institute Research Challenge team. The JU Davis College of Business sent a team for the first time in the annual contest, and it came out on top against opponents from the University of Florida (CFA ‘15 national co-champion team), Florida Atlantic University (CFA ’16 Florida champion team) and Lynn University at the CFA Institute Research Challenge-Florida final four competition at Florida Gulf Coast University. 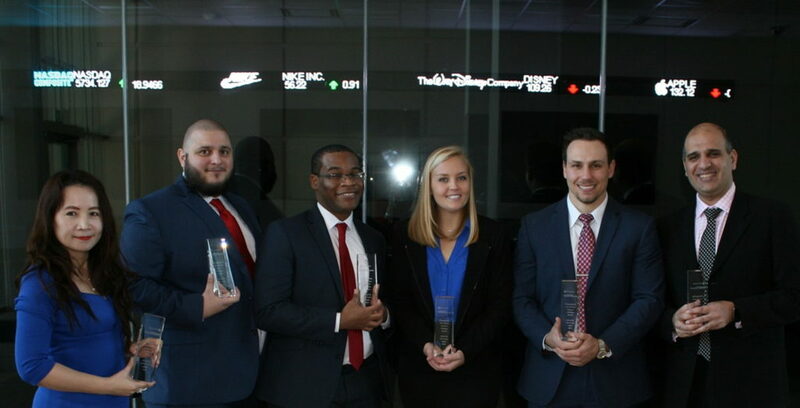 Winning students Micheal Muench, Bryan Shell, Hanna McMahon and Christopher Cartwright were trained by JU Resource Professor of Finance Abdel Missa and industry mentor Austen Cornell, CFA (Chartered Financial Analyst). They exhibited strong passion, dedication and commitment to achieve their goal, their mentors said. 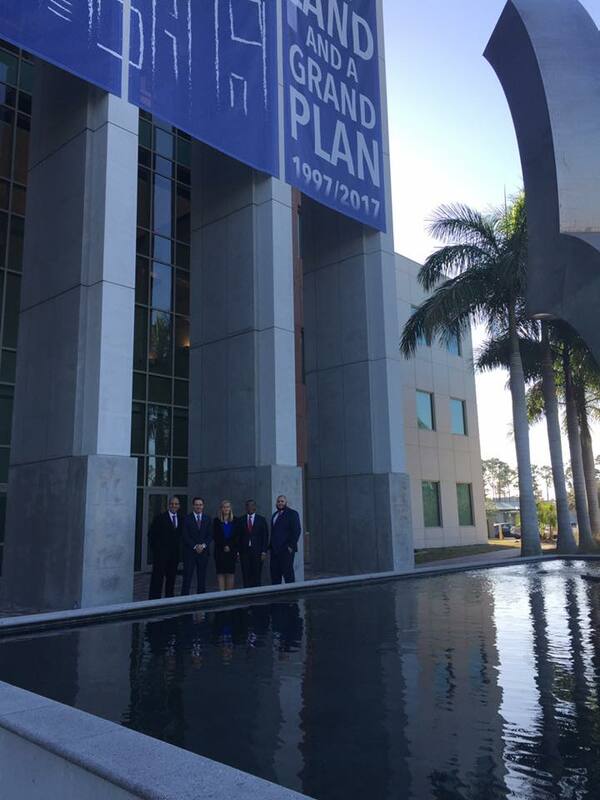 According to Assistant Professor of Finance Daphne Wang, faculty advisor for the Dolphin Student Investment Fund (DSIF), the team could not have made it this far without strong leadership from Business Dean Dr. Don Capener and Dr. Robert Boylan, Department Chair of Accounting, Finance and Economics. Funding support came from David Healy, Senior Vice President for Financial and Facilities Management, and JU’s Florida EPIC (Entrepreneurism, Policy, Innovation, and Commerce), which emphasizes real-world, interdisciplinary, project-based student learning experiences. It was critical to the team’s success, Wang said, because it made it possible to add state-of-the-art infrastructure and a trading room, as well as a Bloomberg Terminal, which offers financial services used by various institutions including news, research, analytics and communications tools. All of the JU students are analysts for the Dolphin Student Investment Fund, and professors Abdel Missa and Daphne Wang are faculty advisors for the program. The investment fund at the Davis College of Business was established in 2009 with an endowment from the Davis family. As of Dec. 30, 2016, assets under management totaled $623,157, with a 24.66 percent return in 2016. The investment fund provides students with valuable real-world experience in money management, including stock selection and portfolio management. The goal of the fund mirrors JU and President Tim Cost’s vision of not only providing students with strong theoretical background, but also applied training to empower students to find top positions and be productive as soon as they graduate. The CFA Institute competition features students working in teams to research and analyze a publicly traded company — sometimes even meeting face-to-face with company management. Each team writes a research report on its assigned company with a buy, sell or hold recommendation. Members make a 10-minute oral and visual presentation and defend their analysis to a panel of industry professionals. The assigned subject firm for Florida local competition this year is Hertz Global Holdings (NYSE: HTZ). The Challenge gathers students, investment industry professionals, publicly traded companies and corporate sponsors together locally, regionally and globally for a real-world competition. All participants are introduced to and held to the standard of the CFA Institute Code of Ethics and Standards of Professional Conduct. All state champion teams will be broken into two Americas sub-regions and compete within those sub-regions to determine two Americas Champions. The winners from each regional competition advance to the Global Final April 28 in Prague, Czech Republic. The first Research Challenge competition was hosted by the New York Society of Security Analysts in 2002 and involved just five teams from the New York area. Since then, the competition has grown to involve tens of thousands of students from more than 900 universities in more than 75 countries.